In gaming, the licensed super-hero genre has been dormant for a little while. I think the last big-budget super-hero games were Batman: Arkham Knight (2015) The Amazing Spider-Man 2 (2014). So, it’s been about three years since any super-hero game has hit the market, give or take. Well, Marvel’s Spider-Man is here and not only is it one of the best super-hero games I’ve played, but it’s also one of the best games of the year. Firstly, for those unaware, Marvel’s Spider-Man doesn’t take place in the popular Marvel Cinematic Universe. Tom Holland isn’t voicing Spider-Man. He’s not a teenager, and there’s no Marisa Tomei as Aunt May either. This game is divorced from anything of that nature and it works supremely well. 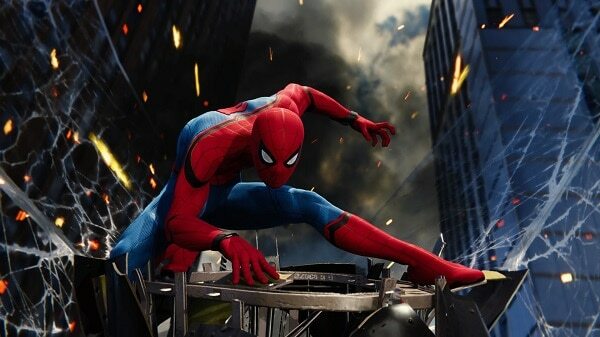 In this game, Peter is around a 25-year-old guy, having worn the Spider-Man suit for a number of years. He and Mary Jane lived together for a while but split up, with her knowing full well that Peter is Spider-Man. 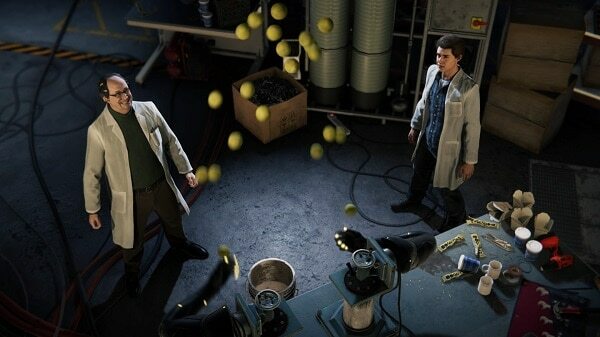 Peter’s job is working with famed non-super villain Dr. Otto Octavius as they try to perfect an artificial limb system. Gee, nothing could go wrong here, right? Aunt May works at a homeless shelter named F.E.A.S.T., under the direction of Martin Li who is harboring a dark secret. 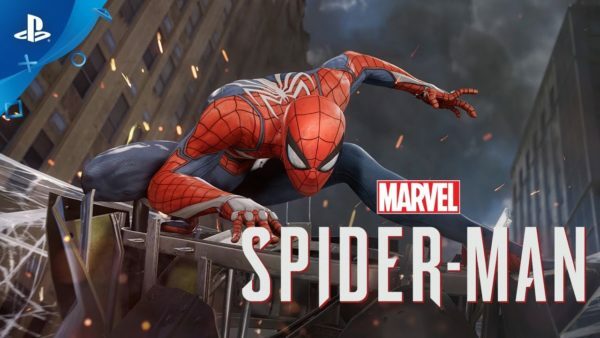 In terms of video-game story, I would say that Spider-Man is on the top of the list. Peter is portrayed extremely well, not just by his voice actor (which I’ll get into below) but in terms of personality and motivations. Aunt May is older but not doddering and does have some vibrancy in her. Mary Jane is reckless and feisty but still can take of herself. Actually, the most surprising aspect is how the game handles the villains. Some of them barely get any screen time, like Rhino or Electro. But characters like Otto Octavius and Martin Li actually come across as real people, which makes their downfall to both the player and Spider-Man all the more impactful. The prior benchmark in Spider-Man web-swinging was Spider-Man 2 on the PS2/GC/Xbox generation of consoles. 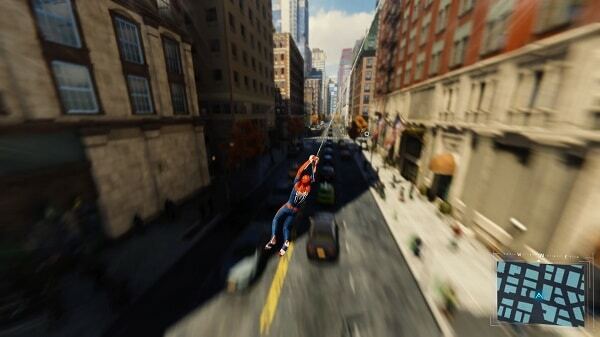 That swinging worked because you controlled each arm (with webs) and you actually had to latch webs onto buildings to get around. If you were in Central Park you just didn’t magically swing to a high vantage point because there were only trees around. It added a sense of realism to the system that made it memorable. In this Spider-Man, they’ve simplified it a bit, while also keeping the core of the system in place. And it feels utterly fantastic. Your basic swing is with the R2 button while in the air. Spider-Man latches onto a building and begins the swinging arc. During the arc, you can either release R2 to do another swing with the same momentum or you can press X to do a jump off your swing, which will help you gain momentum. You can hold L2 to aim at an anchor point and web to it with R2. This nets you a huge momentum boost once you get the timing down right. Finally, you can press X in mid-swing to do a quick web-zip forward, which isn’t fast at all but does help you move horizontally with some precision. I really want to drive this point home, the web-swinging feels natural, fast, fluid, a little dangerous, but always fun. There are other moves you can unlock like dives, charge jumps, etc., but the basic swinging in the game never gets old and is constantly a blast. 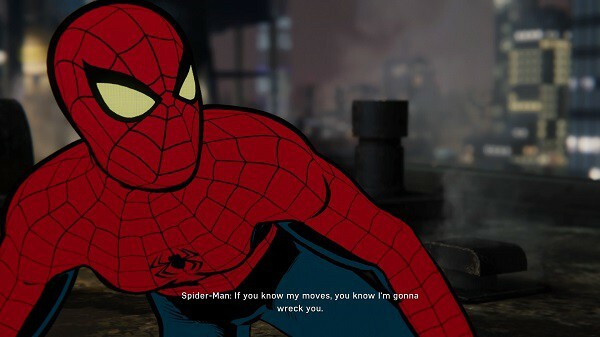 Combat in Spider-Man is also very rewarding but does take some time to actually feel good. Your basic melee attack is with Square. While your web-shooting is triangle. Circle is used to dodge attacks while X jumps. You can pop up a gadget wheel with L1, then press R1 to actually use them. To say that Spider-Man’s combat is influenced by Batman: Arkham Asylum is putting it mildly. This isn’t bad of course, AA had one of the best combat systems ever in a game. It’s just nice to see where the influence is drawn from. Typically, you’ll get into an encounter, punch a few guys, dodge some shots or attacks and counterattack, rinse and repeat. You can throw in some web attacks or gadgets here and there too. Execute finishers once your combo meter hits a certain point, have access to a suit power super move, etc. The basic function of combat is very akin to Batman, and that’s not the only thing “borrowed” from that franchise. Batman in the Arkham games is a generally stealthy hero. If he goes up against guns, or particular heavily-armored foes, he’s gone. So, instead, he takes down baddies with tactics and cunning. Spider-Man doesn’t quite have as many stealthy moves at his disposal, but he can still dispatch foes from the darkness with ease. Perch Takedown: Spider-Man can perch on top of roofs, telephone poles, light poles, etc. You can silently drag an enemy to you with your webs and automatically tie them up from where you are, letting them dangle in the air. Web Strike Takedown: If you’re far from an enemy but still in stealth, you can press triangle to instantly zip over to them and give them a firm kick to the head which instantly knocks them out. These are the two moves you really use to do stealth sequences. You can click in R3 to do a scan of your local area. This lets you know when it’s safe or dangerous to actually do a stealth takedown. Dangerous is when an enemy is in view of another enemy, so you can lure enemies away from one another with shooting webs at boxes or even the ground. I mentioned above the suit power. This is a meter that refills gradually over time. You can slot in one suit power, which you get when you buy/craft new Spider-Man suits. Each one has their own unique ability. For example, the Spider-Man Noir suit makes it so enemies can’t call for backup when alerted. 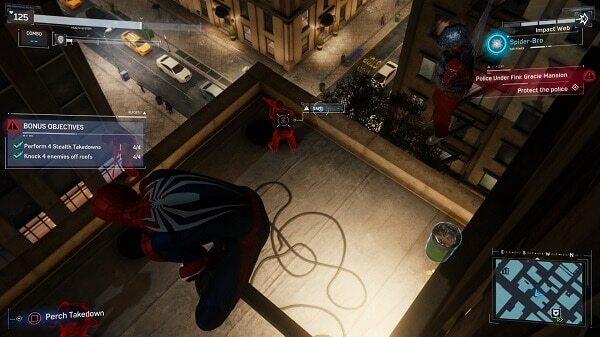 While the Spider-Punk suit unlocks Rock Out which creates an area-of-effect knockback with sound. The best part is that you can mix-and-match your suit power and costume. 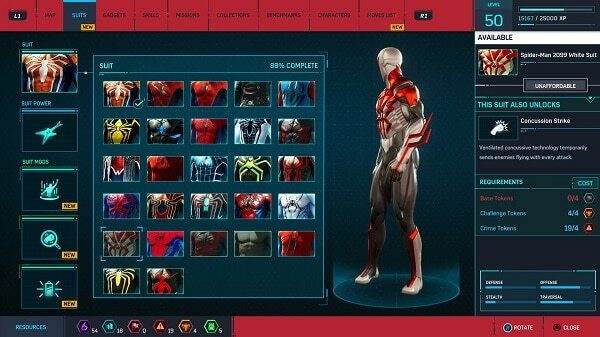 So, if you want the Spider-Man 2099 suit but want the Secret War Suit EMP power, you are free to do so. There are also gadgets available as well. Almost all of these are unlocked via story progress too. So, if a side mission requires a gadget that you don’t have, which can occur, just keep playing through the main story and you’ll eventually unlock it. I won’t spoil every gadget but some of them include impact webbing, web bombs, and even Spider Drones, just to name a few. Almost all of them are useful in combat and can be upgraded to enhance the number you can carry or general effectiveness in the main menu. 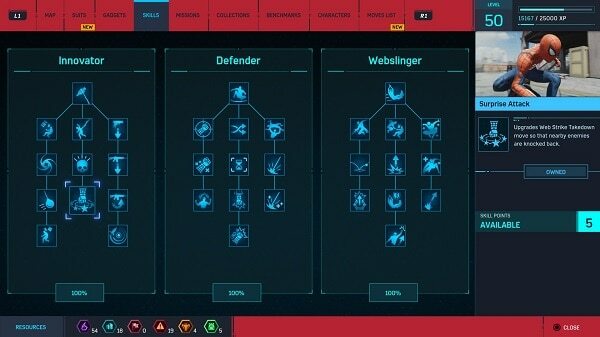 Aside from your basic web shooters which refill over time, your gadget inventory typically only refills once enemies are defeated. So, keep that in mind if you want to blast a ton of guys with your impact webbing but run out. To buy new suits and to upgrade gadgets you need to spend tokens. There are a few different tokens which you’ll collect as you play: Crime, Base, Challenge, Landmark, Research, and finally Backpack. I won’t go in depth too much, that’s what playing the game is for, but you’ll acquire a ton of tokens as you play and most of your upgrades and suits can be unlocked before the end of the game. Experience points are also doled out for completing missions, stopping crimes, doing side activities and so on. There are three main branches of the tree: Innovator (stealth), Defender (combat) and Webslinger (Aerial) branches. You get an experience point after you level up and it’s a pretty straight-forward process. Once again, you’ll likely unlock everything before you finish the game. You also unlock Suit Mods after reaching certain level milestones. Like, once you hit level 8 you get the Scavenger suit mod, for example. You can equip up to three mods and these are passive bonuses which can help turn the tide in battle. Scavenger regenerates gadget refills once you do a finisher. While Blast Plates help reduce rocket damage. You unlock mods through Tokens. To say that there is a breadth of side content in the game is putting it mildly. There are various crimes to stop, people to rescue, criminal hideouts to shut down, important buildings to photograph, etc. Everything generates either experience or tokens, so while you don’t have to obsess over each thing, it is beneficial to do some side stuff as you play through the main game. The in-game map is divided up into different areas of Manhattan, Harlem, Central Park, Midtown, etc. Each area gives you a percentage meter for the district for how complete it all is. Unless you really go hard, this likely won’t be filled out by the time you beat the game, but the after credits roll, you’re free to mop up any extra stuff. There are a few more curated side missions for you to undertake. One involves you chasing Black Cat figurines. While another has you trying to take down Tombstone’s drug business. While these are generally good, one small fault I have with the game is that there doesn’t quite seem to be enough of these available. Quite frankly, Spider-Man has a laundry list of wacky and obscure villains that could have been used in these missions. About the only character they use in this fashion is Screwball, who I had *no* idea who/what she was. If the game had updated some of the weirder villains, it would have been great. Imagine Hypno-Hustler as a Skrillex-like DJ who creates different hypnotic commands with drops of music. What if Big Wheel was just tearing up the city and you had to web-swing around it, shooting webs into it, to cause it to stop working. They could have had Hammerhead be a nuisance in the game, just kind of appearing in battles, and you just take him out with a single punch. Spider-Man does keep it fairly realistic so introducing just a few fantastical elements would have been appreciated, by me at least. 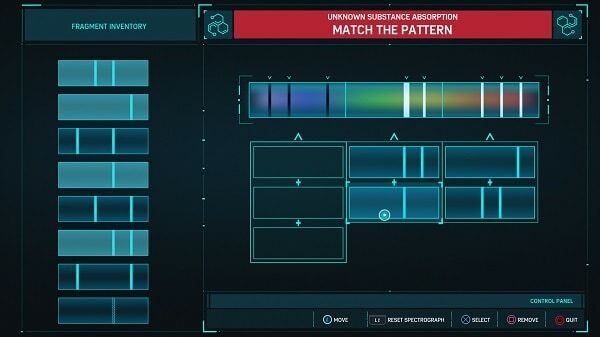 Much has been made about certain sequences in the game where you play as Mary Jane or Miles Morales. These sequences are pretty basic stealth sequences, you hide behind boxes, wait till guards backs are turned, and run for the next waypoint. Honestly, these sequences aren’t great but they aren’t bad. There’s only about eight or so in the entire game. I only failed one and that was because I was really sloppy during one sequence with Mary Jane, but a quick reload and I passed it. These parts aren’t the best thing, but you can just do them and move on. The last thing I’ll really bring up is that both visually and aurally the game is superb. Manhattan is a joy to explore, and while the island isn’t a one-to-one representation of the real place, it’s damned impressive what they accomplished. Also, the music and voice acting are solid. Yuri Lowenthal, for years now, has usually played supporting roles in games/cartoons. Occasionally doing lead roles, but more often than not, he flies under the radar for most projects. As Spider-Man he is front and center and he infuses Peter with an actual personality that is full of charm. Yuri’s wife Tara Platt (herself a voice actress), in perhaps one of the greatest ironies ever, doesn’t voice Mary Jane Watson. Instead, she does Yuri Watanabe, who is pretty much Spider-Man’s wife in the game as is. Every other actor is solid in their roles as well, but both Yuri and Tara deserve special mention. Overall Score: 10 out of 10 When they announced this game I was super excited. Marvel’s Spider-Man not only matched but wound up exceed all my hopes for it. While Arkham Asylum was arguably the originator for a lot of the core gameplay systems, Spider-Man really evolves them and makes things like just exploring the city or beating up random thugs a real joy. God of War is still probably my number one Game of the Year, but Marvel’s Spider-Man is currently a very close second.